President Donald Trump ordered thousands of additional American troops to the southwest border over the next two months, according to a document drafted last week by Defense Department officials and obtained by Newsweek. 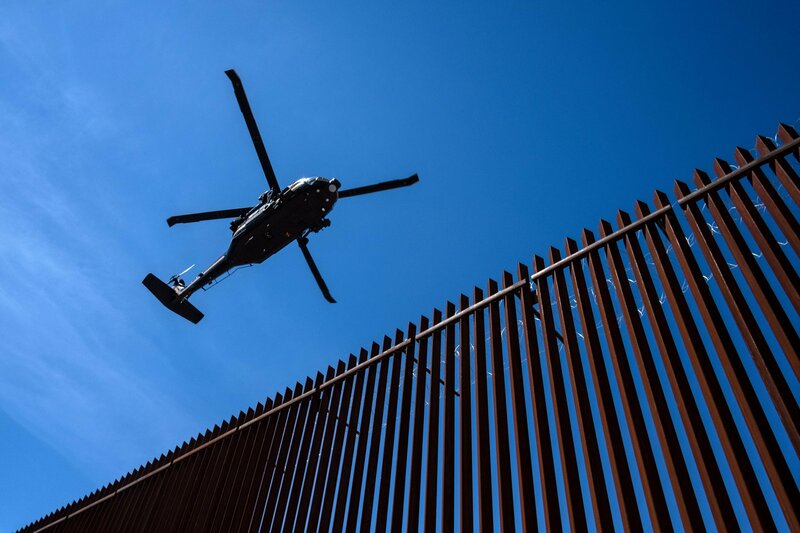 Officials in U.S. Army North, the unit overseeing the border mission, drafted the deployment orders in anticipation of a new request from Homeland Security to aid U.S. Customs and Border Protection in the ongoing joint agency border mission. 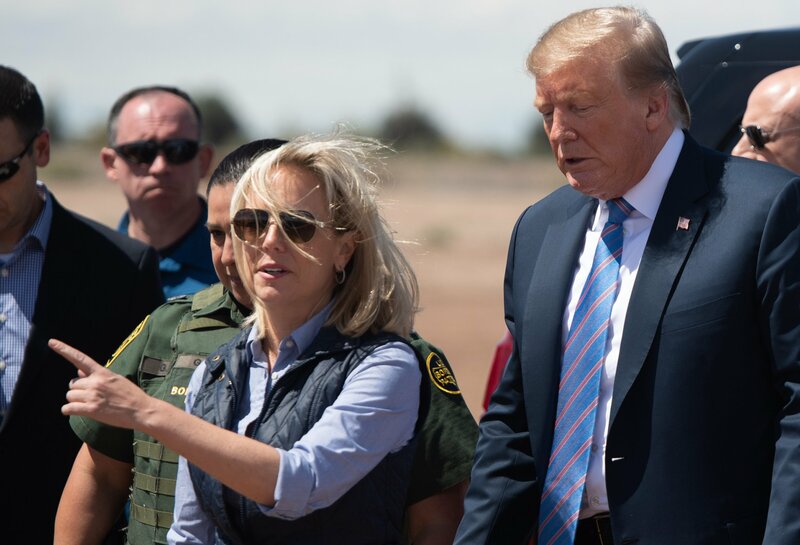 The document further demonstrated President Trump’s increasing urgency to address a crisis at the southern border, with the orders being drafted days after Homeland Security Secretary Kirstjen Nielsen resigned on April 7. Four Defense Department sources told Newsweek the document appears to show between 9,000 to 10,000 moreU.S. forces heading to the southwest border over the next few months; however, the Pentagon said Tuesday the document is misleading as not every individual service member in a unit selected to deploy will go. A Pentagon spokesperson told Newsweek by phone Tuesday morning that U.S. military planners are anticipating sending a "brigade minus" or about 3,000 additional U.S. forces to join units already at the border, but they had not received a new request for assistance from Homeland Security to identify how many additional troops would be needed. However, on Tuesday afternoon, the Pentagon emailed a Newsweek reporter and said the number is not 3,000, and the document Newsweek obtained was a draft copy and if Acting Defense Secretary Patrick Shanahan approved any Homeland Security request, the number of additional troops would range between 300 and 500. Three Defense Department sources told Newsweek the document is not a draft copy and if it were, draft would be displayed on the document near the classification markings. At the bottom of the copy obtained by Newsweek, U.S. Army Lieutenant General Jeffrey Buchanan, the commanding general of U.S. Army North, authenticated the document. Roughly 2,800 active duty forces currently support the border mission, U.S. Army North told Newsweek via email on Tuesday. Approximately 1,200 of those forces work on the Mobile Surveillance Camera mission, with about 1,000 service members dedicated to fortifying ports of entry in Texas and New Mexico. The other 200 personnel serve as part of a crisis response force, with the remainder being assigned to headquarters and logistics support. About 2,100 National Guardsmen are assigned to the border mission as well, according to numbers given to ABC News. “Our support is very elastic, and given the deterioration there at the border, you would expect that we would provide more support,” Shanahan said. Although unclassified, these documents are not released to the public and are for government use only, as the papers are used to coordinate the movements of units and their assigned tasks. The deployment orders were sent to Newsweek by two independent U.S. military sources and can be read at the bottom of this story. Before publication, Newsweek redacted names of service members and serialized unit identification codes. A U.S. military source said they were not aware of a new request for assistance from either DHS or U.S. Customs and Border Protection, but said the demand for more military forces came from the White House. Neither the White House nor DHS responded to requests from Newsweek to provide comments for this article. The 25-page record is known as a fragmentary order, or FRAGO for short. A FRAGO is a tranche of an operations order and is used by U.S. military planners as addendums to an existing mission, or when there is a change from a previous fragmentary order or the original operations order issued to Defense Department units to execute a task. The additional forces would be tasked with helping the Defense Department carry out its mission to assist U.S. Border Patrol officials “with planning, intelligence analysis, detection and monitoring and other support in order to enhance security along the international border,” according to the deployment orders. Among the “other support,” is the military’s ongoing “mobile surveillance camera operations” at the border, as well as its “wire mission,” which has seen military members laying concertina wire across the southern border since Trump first announced plans to send more than 5,000 active-duty military troops in late October 2018. The orders also asserted that troops would be expected to “apply the appropriate law enforcement response to secure the southwest border” until the end of their deployment. Last November, Newsweek first reported that President Trump approved the use of troops for law enforcement tasks at the southwest border without violating the Posse Comitatus Act, the 1878 federal statute that restricts the government’s ability to use the U.S. military as a police force. The president expanded the authorities of the Defense Department at the border, including, permitting the use of lethal force, according to a White House memo obtained by Newsweek last year. The memo allowed U.S. service members to perform “military protective activities,” permitting service members to use “a show or use of force (including lethal force, where necessary), crowd control, temporary detention, and cursory search,” as determined by the defense to protect agents with Customs and Border Protection. Among the units extended until September are two Marine infantry companies from 2nd Battalion, 4th Marine Regiment, and 1st Light Armored Reconnaissance Battalion, both out of Camp Pendleton in California. Marine Captain Paul Gainey told Newsweek on Monday that 1st LAR did not deploy to the border with their light armored vehicles, an eight-wheeled armored vehicle equipped with a 25 mm M242 Bushmaster chain gun and two M240 7.62 mm machine guns. Last week, Marine Commandant General Robert Neller said Marines deployed to the southwest border did not negatively impact service readiness when testifying before the Senate Armed Services Committee during a hearing for next year’s defense budget. However, in letters written to Acting Defense Secretary Patrick Shanahan and Navy Secretary Richard Spencer in February and March of this year, Neller said “unplanned/unbudgeted” fiscal line items, including the southern border deployment, is an “unacceptable risk to Marine Corps combat readiness and solvency.” The Los Angeles Times first reported the letters. Newsweek later reported the internal memos were leaked purposely by senior Marine Corps leadership to draw media attention to service families living among hurricane-ravaged military installations in North Carolina. On Friday, Democratic Senator and presidential candidate Elizabeth Warren asked Neller if any military training exercises had been canceled or if units missed scheduled training, due to budgetary issues. Neller said he did not know of any exercises that had been canceled. The Marine commandant did say fewer Marines did participate in one exercise and a small number of Marines were sent to the border mission instead of engaging in scheduled training. However, Neller’s March 18 memo showed the Marines canceled at least three planned military exercises. Newsweek contacted Marine headquarters seeking clarification on Neller’s comments before the Senate, but no comment was received. The timeline for the new deployment is in line with the Pentagon’s announcement in January that it would be extending its border mission through the end of September, dragging the domestic deployment out to nearly a year. The documents describe the “security of the United States” as being “imperiled by a drastic surge of illegal drugs, dangerous gang activity and extensive illegal immigration” at the U.S.-Mexico border. “The situation at the border has reached a point of crisis” and “threatens [the] safety of citizens and undermines the law,” the orders state. Data from the U.S. Customs and Border Protection agency released last week showed that March saw its highest rate of apprehensions at the U.S.-Mexico border since 2007, at 92,000. The agency noted, however, a large share of the recent surge in arrivals at the border has been comprised of families fleeing Central America. enforcement appears to have led to 481 apprehensions in the first five months of FY 2019, compared with a total of 808 in the year prior. The same day the U.S. military documents were drafted last week, President Trump told reporters at a roundtable event in San Antonio, Texas, last Wednesday that he was “going to have to call up more military” in response to the recent surge in arrivals of asylum seekers at the southern border. The president also appeared to bemoan that military members could not get “a little rough” with asylum seekers. “Our military, don't forget, can't act like they would normally act because if they got a little rough, everybody would go crazy," Trump said, before appearing to blame “horrible laws that the Democrats won’t change” for the military’s inability to exercise more force. The comments came days after the ouster of Homeland Security Secretary Kirstjen Nielsen, on April 7. In the lead-up to her resignation, Nielsen rebuffed pressure to submit a new request to the Defense Department seeking the support of thousands of new U.S. forces at the U.S.-Mexico border, a military official within the Pentagon told Newsweek,speaking on the condition of anonymity due to media regulations governing contact with members of the press. Nielsen’s departure from the White House came after months of speculation over when, not if, the former DHS chief’s turbulent tenure at the White House—and equally tumultuous relationship with Trump—would be brought to an end. Throughout her more than two years as head of the department, reports abounded of Nielsen being repeatedly berated by Trump in private and in front of her peers over her leadership on slowing the influx of undocumented immigrants, which the president has made a central focus of his administration. Trump had reportedly asked Nielsen to close the ports of entry along the border and to stop accepting asylum seekers, The New York Times reported on April 7. The president denied those claims in a tweet Sunday. A U.S. military source briefed on the heated exchanges between the White House and DHS confirmed the Times’ reporting and told Newsweek of Nielsen’s alleged refusal to submit an additional request for more U.S. troops in the run-up to her resignation. “Yes, not only that, it was becoming routine for her to answer, ‘Mr. President, I would love to, but it’s illegal to do so,’” the source said. Attempts to reach Nielsen by Newsweek via phone and email were unsuccessful. After several requests, a spokesman for Thompson’s committee was unable to provideNewsweek with comment regarding Trump’s latest troop deployment order to the southern border. The committee’s top Republican, Congressman Mike Rogers, provided a statement via his communications director, Nicole Hager. Last edited by JohnDoe2; 04-16-2019 at 11:26 PM. Why? Is he sending them to help the Border Patrol bring more of them in faster to deliver them to safety zones in Sanctuary Cities? stoptheinvaders, Beezer, Againstallamnesty and 1 others like this. TRUMP CAN END THIS RIGHT NOW...THIS MORNING BY MAKING THIS PROCLAMATION EFFECTIVE IMMEDIATELY! Section 212(f)of the Immigration and Nationality Act (INA) gives the President of the UnitedStates broad authority to implement immigration restrictions by proclamation. 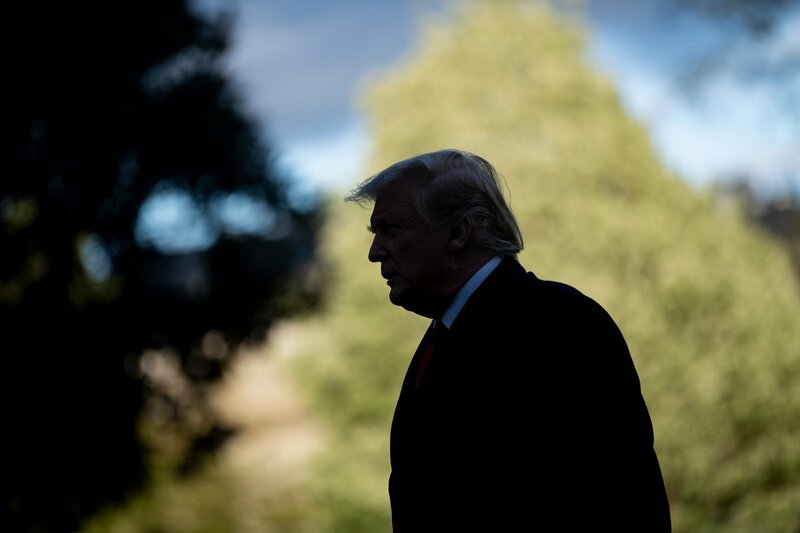 The statute allows the President to suspend the entry of any aliens or of a classof aliens or place restrictions on the entry of a class of aliens temporarilyif he or she determines that the entry of such aliens would be detrimental tothe U.S. interest. 90-day pause on ALL refugees, TPS, asylum claims from around the world and at our border! Do not discriminate...include all foreigners applying to come here! Then extend it 12 more months and clean up this mess! Ship the UACs back home! Where is A.G. Barr? Get this on his desk for signature and turn them away at the border! Yep, as long as we continued to allow the so-called asylum claimants to pour in we could have a million troops at the border and it wouldn't do a bit of good! Last edited by MW; 04-17-2019 at 11:36 PM. Yep, as long as we continued to allow the so-called asylum claimants to pour in we could have a million troops and the border and it wouldn't do a bit of good! They do not have to continue to pour in, and Trump does not need Congress to fix it , He can sign 212(f) and put the military on the border to STOP them, instead of welcoming them. Section 212(f)of the Immigration and Nationality Act (INA) gives the President of the United States broad authority to implement immigration restrictions by proclamation.The statute allows the President to suspend the entry of any aliens or of a class of aliens or place restrictions on the entry of a class of aliens temporarily if he or she determines that the entry of such aliens would be detrimental to the U.S. interest.